4:2:2 A statement of sampling frequencies used to digitize the luminance and color difference components of a video signal. The term means that for every four samples of luminance (Y) there are two samples each of the color difference signals (B-Y and R-Y). Most commonly, the 4 represents sampling at 13.5 MHz. 4:2:2 at 13.5MHz sampling is one of a family of sampling sets described in Rec. ITU-R BT.601-5. It is incorrect to equate ‘601’ and 4:2:2. AES/EBU Audio A digital audio interface jointly specified by the U.S. based Audio Engineering Society and the European Broadcasting Union. Operates at several sampling frequencies, 48 kHz for television equipment, and 44.1 for CDs are the most common. See AES3 / ANSI 4.40 for additional details. Betacam SP Trademarked component analog videotape recording format consisting of the signals Y/R-Y/B-Y. Betacam SP is recorded on oxide or metal tape. Chrominance The color information in a composite video signal. This information describes the hue and saturation of a picture, but not the brightness. The brightness and contrast are described by the luminance component of the signal. The signals I, Q, R-Y, and B-Y are all examples of chrominance information. Closed Captions Program dialogue or narration encoded as electronic subtitles on Line 21 of the video signal and visible only with a captioning decoder. Color Burst GVS9000VTR offers a sample of the subcarrier frequency placed after the trailing edge of horizontal sync. It is used in determining the decoded phase (color) of a composite analog video signal. Color Burst is inserted by GVS9000 VTR encoder to enable a decoder to regenerate the color subcarrier. May also be referred to as Burst. Color Gamut: Serial Digital Interface. (SMPTE 259-M) A standard for serial transmission of digital video over coaxial cables. The 259-M standard supports composite digital and 4:2:2 component digital video formats using ITU-R BT 601 specifications for 525 and 625 line video, with 8 and 10 bit luminance sampling. Data transmission is based on a signaling rate of 270 Mbps or 360 Mbps with support for cable runs of several hundred meters. Component Video Video consisting of three independent signals; one luminance and two color difference signals or Green-Blue-Red signals. Video whose original elements have been retained separately rather than combined (encoded) into a single signal known as composite video. Component video is technically superior to composite video, especially when repeated encode/decode processes are required. This is often the case during the production process. Also, any time video components are combined into a composite format, such as NTSC or PAL, it is never quite possible to obtain the exact original signals again. The bandwidth restriction of the composite formats is only one of several reasons for this. See composite video. Composite Video A single signal with luminance, chrominance, sync, and color burst. A video signal in which the luminance and chrominance components have been combined (encoded) as in NTSC, PAL or SECAM. Any time a signal is encoded, the quality of the final signal available is reduced because absolutely perfect decoding is not possible (decoding is required to view the final picture). Composite video was developed in order to “squeeze” color information into the same broadcast bandwidth originally occupied by black and white. This avoided total replacement of all monochrome television transmitters and receivers. See Component Video. A video signal obtained by combining parts of at least two video signals, for example by keying or matting. D-2 A 4Fsc sampled digital composite video recording format. This format samples the analog video signal on the I and Q axes in NTSC (PAL samples at + and – 135 degrees) and records a digital representation of the composite video (NTSC or PAL) onto 19mm tape cassettes. D-3 A 4fsc composite digital recording format on 13 mm (1/2”) magnetic tape. It exists in three versions: for NTSC, PAL, and PAL-M systems. D3 has minor interface differences with D2 equipment. D-5 A component digital tape recording format. It exists in two versions: with 13.5 MHz sampling rate and 18 MHz sampling rate, sometimes referred as D5H and conforming to ITU-R BT 601. A tape recording format based on ½” D5 tape but in this case recording component signals sampled to ITU-R BT 601 recommendations. D5 VTRs may well also play back D3 tapes with internal decoding providing component outputs. Care will be needed to identify the source tape as being composite or component where highest quality images are needed in post production. Digital BETACAM A development of the original analogue Betacam VTR which records digitally on a Betacam style cassette. It uses mild intra-field compression to reduce the ITU-R 601 sampled video data by about 2:1. Some models can replay both digital and analogue Betacam Cassettes. Drop-Out Video impairment appearing as specks during playback, caused by scratches or pieces of contaminant on the tape, leaving spots where no signal is recorded. 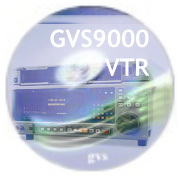 With GVS9000 VTR there is no drop-outs. DVCAM Trade name for professional version of the consumer DV format. DVCPRO Trade name for digital compressed videotape recording format. DVCPRO equipment is backward compatible with consumer DV tapes, but has wider 18-micron head, higher tape speed and use azimuth recording. Sampling format is 4:1:1, which means that sampling frequencies are: Y –13.5 MHz, Pr/Pb – 3.375 MHz. Quantization resolution is 8 bits/sample. DVS Descriptive Video Service. Narrated description of visual action for the vision impaired. Carried on separate audio track of video recordings and broadcast on a SAP channel. Embedded Audio Method of transmitting a digital video signal together with accompanying (multichannel) sound by way of insertion of audio data packets in the digital video stream. High Definition HD D5 A compressed recording system (approximately 4:1) for High Definition material on D5 cassettes. High Definition D5 supports both 1080 interlaced and 720 progressive standards. Four channels of uncompressed digital audio are included. Horizontal Blanking The portion of the scanning line not carrying picture. In NTSC, the Horizontal Blanking Interval carries a synchronizing pulse and a color reference signal. Used to make the return trace of picture tubes invisible. Horizontal Overscan A safety margin that manufacturers build into consumer television receivers to prevent them from displaying black edges on the sides of the picture, i.e., the entire active video line is not displayed. Inter-Channel Timing The difference in propagation time between two or more channels. Differences in timing, or timing errors, create audible or visual discrepancies. Even errors in the nanosecond range can create color registration errors in component video systems. Letterbox A term used to describe a means of accommodating greater aspect ratio by adding blank area above and below the picture. The resulting image has a noticeable top and bottom border, not unlike what you would see looking through the slot of a letterbox. . Letterbox is being used more frequently as 16:9 images are shown on 4:3 displays. Lip-Sync Error In a system involving the simultaneous presentation of sound and motion video, the degree to which the audio and video are in sync. The name lip sync comes from the observation of a talking head scene, which is one of the most critical cases for audio/video synchronization. LTC Longitudinal Time Code. Time code recorded on one of the audio tracks or on a dedicated linear time-code track on videotape. This can easily read when the tape is moving forward or backward, but not at a freeze frame, when time code recorded with the picture material (VITC) can be used, which all GVS9000 VTR support. Luma Short form of the term Luminance. A signal that conveys monochrome or brightness information. Luminance The monochrome component of a color video signal. Often designated “Y”. MTS Multi-channel Television Sound See SAP. Open Captions A program’s narration and dialogue displayed in video text, usually appearing in the lower-third of the television picture and visible without a caption decoder. Reference Color Bars All GVS9000 VTR do offer test signal recorded at the beginning of a program or other recording that represents the video levels and other signal parameters used in the recording. The signal is specified by EIA RS-189A as modified by SMPTE EG-1. Sampling Structure A three part number representing the number of samples of luminance and color difference components of a video signal. Common structures are 4:2:2, 4:1:1, 4:2:0. 4:2:2 – On each line of the image, luma is sampled at 13.5 MHz, each color difference signal at 6.75 MHz. 4:1:1 – On each line of the image, luma is sampled at 13.5 MHz, each color difference signal at 3.375 MHz. 4:2:0 – On each line of the image, luma is sampled at 13.5 MHz, the color difference signals are sampled at 6.75 MHz but at half the vertical frequency. SDI Serial Digital Interface. (SMPTE 259-M) A standard for serial transmission of digital video over coaxial cables. The 259-M standard supports composite digital and 4:2:2 component digital video formats using ITU-R BT 601 specifications for 525 and 625 line video, with 8 and 10 bit luminance sampling. Data transmission is based on a signaling rate of 270 Mbps or 360 Mbps with support for cable runs of several hundred meters. Setup In an NTSC composite signal, 7.5 IRE, the lowest point in the signal that luminance components are permitted. It should be noted that the color, or chrominance, components do not have this restriction. Also called Black Level. In component video systems setup is not used. SMPTE Time Code (SMPTE 12M) A method of assigning unique identifying numbers to each frame of video recorded on videotape and some video servers. Time Code is important in editing and in automation. Each frame is identified with hours, minutes, seconds, and frame. There are two general methods of counting: Nondrop frame and Drop Frame. In video running at 29.97 frames (59.94 fields) per second (NTSC) the former accumulates an error of about 3.6 seconds in each hour. Drop Frame Time Code compensates by dropping frame 00 and 01 from the count at the start of each minute except minutes 00, 10, 20, 30, 40, and 50. This standard defines a means of interconnecting digital video equipment with a dual link HD SDI (link A and link B), based upon the SMPTE 292M data structure. The source formats for this dual link interconnection are the picture raster formats, and digital interface representations as defined in SMPTE 274M. The total data rate of the dual link connection is 2.970 Gb/s or 2.970/1.001 Gb/s. This dual link also supports carriage of the embedded audio, the ancillary data, and the ID of the stream. This standard specifies the basic formatting structure of the ancillary data space in the digital video data steam in the form of 10-bit words. Application of this standard includes 525-line, 625-line, component or composite, and high-definition digital television interfaces (750 and 1125 lines)and D-Cinema applications that provide 8- or 10-bit data ancillary data space. Space available for ancillary data packets is defined in the document specifying the connecting interface. TBC Time Base Corrector. A device performing a time base correction function often with many other features, e.g. transcoding function as well as noise reduction. Track As used throughout the TOS, Track is defined to mean a physical path on a tape. Channel means a signal path. More than one channel may be present on a track as in the case of an encoded signal. VITC Vertical Interval Time code. Time code added into the vertical blanking interval of a TV signal. May be read by video heads from tape at any time pictures are displayed. Effectively complements LTC ensuring time code can be read at any time. VITS Vertical Interval Test Signals. Test signals inserted in the lines of the vertical blanking interval of analog television signals. Product specifications are subject to change without notice. ©1987-2008 Grande Vitesse Systems, GVS, GVS 90001U-IS, GVS9000 2U, GVS9000 2XU, GVS9000 VTR, GVS9000 2U VTR, GVS9000 2XU VTR, GVS90004NXU, GVS9000 4XU, GVS9000 2U, GVS90001U, GVSAN, ColorITReal, Color IT Real, HD-DV Tracker, MCR, Panoramic, GVS9000 1U, and GVSBASS are trademarks of GVS-Grande Vitesse Systems Inc, all other trademarks are property of their respective owners.